6.0 is expected to be released on October 14th giving us 4 weeks to test out mythic SoO before the release of WoD. My guild is still planning to raid for these 4 weeks to give our two ten man groups time to merge and get used to the new format. I know that feral isn't expected to be very strong in the pre-patch but I was wondering what people have experienced who've played beta. What talents have you been using, I am guessing SotF and NV will be the most desired choices. As far as gearing goes on wowhead you can see how the current gear that has hit or expertise will change, pretty disappointed to see so much haste. I probably wont switch that much gear around but I am guessing multistrike and crit gems will be the go to choices. Then I have a few questions with abilities. Is thrash still worth using in single target or should I assume that the buff to FB will replace that in our rotation. Are thrash and swipe even worth using for aoe or is it just better to tab rake since combo points will not be wasted. Come to think of it I could see feral being pretty strong on certain fights with the ability to multidot much easier now. Dwade, thanks for coming by. Unfortunately, I can't answer your question with anything but guesses, as I'm more of a SimC user then coder, and I don't know how much attention has been paid to making sure everything looks right at 90. Can't argue with your talent choices, since Incarnation/Dream of Cenarius are much less useful without their supporting perks. I'd go FB over Thrash, though I wouldn't decide anything on AoE until the Swipe fix gets incorporated into the SimC code. Last edited by Zstriker on Wed Oct 08, 2014 2:24 am, edited 1 time in total. These are the stat weights from my 6.0 testing with the changes so far. What this means is that assuming these weights carry over to live, crit is king come 6.0.2 until we start leveling again. Given how close Agi and Crit are in the weights, that means we gem straight crit when possible and gem Crit/Haste in red slots as gaining 10 haste and 10 crit is better than 5 agi and 10 crit based on stat weights. I did test gemming straight agi vs gemming the previous mentioned way and gained around 800 dps which is a good chunk considering in BiS gear from my testing we are simming at ~16800 DPS. **This is based off testing done in the past week after we got hit with the nerf bat and given snapshotting is all but gone minus a few of our buffs, mastery becomes trash at 90. It becomes better at 100. I really think that Haste is being over valued with those numbers. On the gear profile you produced what is the stat split? Last edited by Zstriker on Wed Oct 08, 2014 3:04 am, edited 3 times in total. This set and gemming simmed at 16805 I believe the number was. Steakbomb wrote: The increase to shred is there at 90 so combining Incarnation + Berserk and Shred/FB spamming is a good amount of burst but in my testing, SotF came out on top as our go to talent for 6.0. Are you sure about that? According to my tests the increase to Shred is not active at level 90 or level 91. At 100 it seems to be there, so apparently we get it somewhere in between (don't know where exactly as I only have druids of those 3 levels). I've just hit the level 90 dummy on PTR and Beta again - Shred damage is exactly the same regardless of Stealth / Incarnation. The Shred perk has been removed a few weeks ago. Currently Shred should get a 35% damage bonus while stealthed (or during Incarnation) which is not working up to at least Level 91 while it's definitely there at level 100. Agreed. We're back to that we need this for single target and another gear set for multi-targets. Honestly very very few fights are 'true' patchwork encounters that don't have more than one target. Crit/Mastery middle ground might be the best of both worlds. Also with this stat weight it's still hard to judge a 'non' Bis HWF to a Bis H that is Bis. Pre this list for bracers the Wristwatch was BIS now the Mantid is. How does the HWF Wristwatch stack up against a H Mantid? Agi is still above Crit. HWF Wrist is 64 Agi vs 60 Mantid's (assuming just x4 upgrade). They might be very close in dps, despite Wrist lacking crit. energy gain isn't matter much also. its actually to strong on PTR. cooldowns that on live are 1.3 minutes are 55 seconds on PTR. Asashdor wrote: The Shred perk has been removed a few weeks ago. Currently Shred should get a 35% damage bonus while stealthed (or during Incarnation) which is not working up to at least Level 91 while it's definitely there at level 100. This is probably a bug with Shred. Incarnation is going to be powerful for 6.0 and a no brainer when we get to 100. My sims are all single target as the way that most of the ranged are in my guild, they cleave like crazy and I just single target every boss so I looked for the highest single target DPS. On most fights that you could say there is cleave, they adds die so quick that a thrash or a couple swipes, or even a rake on them isn't going to do much overall so that's why the above stats are based single target. Garrosh - Very limited AoE in start of the fight but all I do now is thrash the adds as we stack everything in P1 so they die quick. And in P3 we kite the adds and single target boss. As you can see, most of these fights are in all reality a single target fight as with this gear level and the amount of scrubs that cleave to try and rank is huge, adds die super quick anyway so I have always found it better to single target and let others worry about adds since they die so quick. If this change happened at the start of SoO then it might be different but as of now, most of the fights are single target for the most part. Depending how your guild does each fight then Mastery might be a bit higher on the stat weights but as far as single target goes, in sims, this was the best DPS overall. When I get home tonight I can do some more sims with the newer builds of SimC to see what happens. I can confirm that the newest release of Simcraft is giving me roughly the same results. There are a few factors influencing this, but a quick survey shows that in MoP, bleeds (including rake, rip, thrash, treant rake) made up about 60% of our output. In 6.0 with the default profile, rake+rip (no FoTN and thrash is not worth it on 1 target) give about 40% of our output. So that alone should reduce mastery scaling by ~30%. Add in the buffs to crit we have through new effects on Shred(while stealthed/Incarnation) and FB and I think crit outpacing other stats is not surprising. Essentially, Haste scales our non-bleeds, Mastery scales our bleeds, Crit scales both, and has added incentives. The snapshot changes shifted our damage breakdown significantly more than any other change. 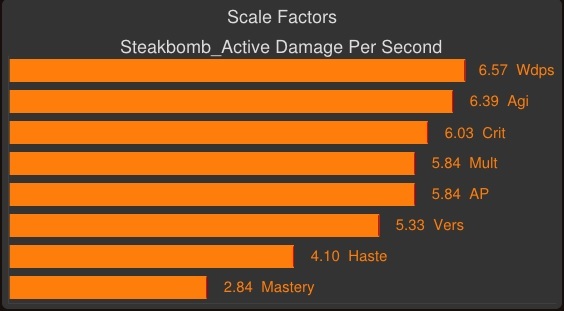 As it stands on live, if played correctly, your bleeds average to almost 3 times the baseline bleed strength because of how often they are under the effect of trinket procs and other modifiers; since we can't do that anymore they do significantly less damage. PS: Working on updating my guide for 6.0 level 90, it should have most of the information you're looking for. So we're not going to keep trash up on single target? I guess you can as long as you have other bleeds applied + SR and nothing else to spend energy on. Could be wrong, though. As far as I know, Shred outpaces Thrash on one target right now. The value of combo points is much higher and as mentioned below, bleeds are less inflated. I didn't check specifically at level 90 gear and abilities, so I'd wait to see aggixx's guide before worrying about it. My math says that at 100, thrash (against a single target) is barely above break-even (relative to shred/bite) if you cast it on clearcasts, and not worth casting outside of clearcasts.